Diaspora networks are increasingly important in the global economy but this report describes Canada’s underwhelming performance in mobilizing our diverse immigrant talent. 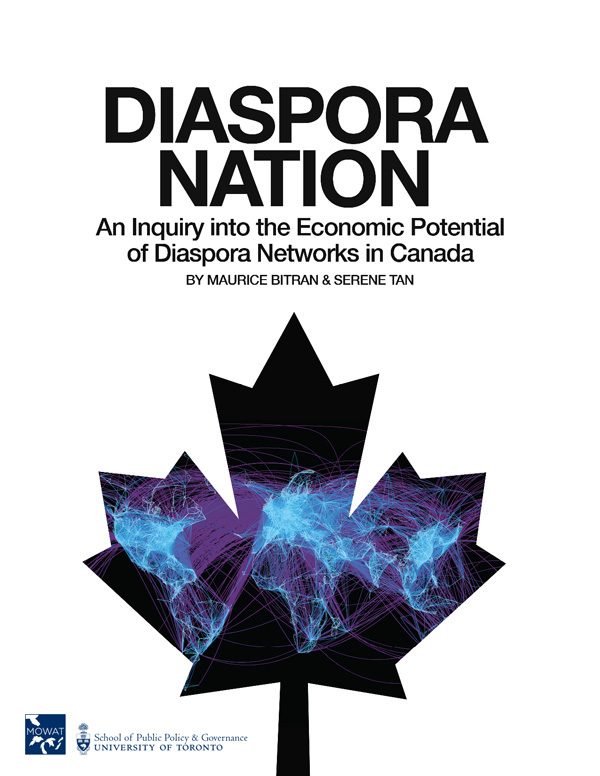 Diaspora Nation outlines how Ontario and Canada can leverage diaspora networks to improve outcomes for immigrants and strengthen the Canadian economy. It also points out that the most realistic and reasonable way for many Canadians to support pipelines and the resulting expansion of oil sands production in Alberta is within the context of a federal price on carbon emissions. As Canadians we take pride in our diversity. We happily think of ourselves as a country of immigrants. By just about any comparative measure, immigrants to Canada have done well and their children have achieved economic success. Most immigrant communities can report relatively successful economic and social participation in Canada. Our collective understanding and definition of the country have been shaped by waves of immigration. Most Canadians cannot imagine a Canadian identity not characterized by diversity. But the ground has shifted beneath us in two important and related ways. First, immigrants to Canada are experiencing poorer economic outcomes than previous generations. And secondly, the global economy is undergoing a re-balancing, with the rise of emerging economies and new structural economic challenges in OECD countries, including Canada. Much of this is well-known. What is less obvious is that the mental maps we use to understand immigration also need to change. Diaspora networks–that is, international communities of shared identity–are changing the way we should conceptualize immigration. Canadians have unprecedented depths of connection with every corner of the world. Canada has become a diaspora nation. Diaspora networks are playing a larger role in the global economy. Recognizing and acting on this trend should be part of a thoughtful policy response to the shifts in the global economy and immigrants’ declining economic outcomes. The recommendations flowing from this report outline some plausible responses. Canada is particularly well-placed to benefit from the growing importance of diaspora networks. Given Canada’s successful history with diversity and accommodation, the country–and Ontario and the Greater Toronto Region in particular, given their high concentration of immigrants–should be leading discussions on how to respond to these changes. I am proud to release Diaspora Nation, which is the product of a year-long process of interviews and research that integrates the perspectives of researchers, stakeholders, and governments. I hope the publication triggers a conversation on how Canada can better reflect the changing nature of immigration and global trade into our policy frameworks.